The Eastern Conference runner-ups reward their head coach after the most successful season in team history. According to Adrian Wojnarowski of Yahoo Sports, the Toronto Raptors and head coach Dwane Casey agreed to a three-year extension. Casey will make $18 million over the life of the contract. The contract runs through the end of the 2019 season, the Raptors essentially “tore up” the original contract to make this new pact. After the team’s elimination from the NBA playoffs, the team reportedly wanted to offer Casey an extension, according to ESPN.com's Marc Stein, later backed up by Toronto General Manager Masai Ujiri. Casey began his Raptors tenure at the beginning of the lockout-shortened 2011-12 season, replacing Jay Triano after a 22-60 record. Toronto managed just one more win that season but consistently improved their win totals every year after, going from 34, 48, 49 to a franchise best 56 this season. Casey led the Raptors to the playoffs each of the last three seasons, the first two appearances ending in first round ousters at the hands of the Brooklyn Nets two years ago and a sweep by Washington Wizards last year. This year, Toronto endured through two grueling seven-game series in the first two rounds of the Eastern conference playoffs against the Indiana Pacers and Miami Heat. Toronto eventually fell in the Eastern Conference Finals to the Cleveland Cavaliers in six games, handing the Cavs their only two losses of the postseason and making the deepest playoff run in franchise history in the process. The teams run as Eastern conference runner-up likely restored some faith in Casey, as questions about his job security rose during the first round set against the Pacers. Casey could be coaching a similar team next season. The Raptors have roughly $70 million in guaranteed salary commitments against a projected salary cap of $92 million. James Johnson and Luis Scola become unrestricted free agents this summer, but likely are not huge losses. The same cannot be said for center Bismack Biyombo and All-Star guard DeMar DeRozan, both men have player options for next season at $3 million and $9.5 million respectively. Biyombo already declined his option and will and some believe he will command an annual salary in the neighborhood of $16 to $17 million, but just short of a max extension according to Sean Deveney of The Sporting News. 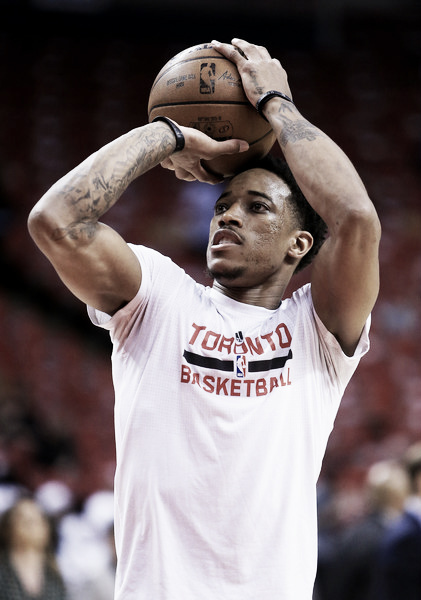 DeRozan, who the Raptors drafted ninth overall in the 2009 NBA Draft, is a possible candidate for the max should he decline his option as well. Toronto probably has only enough room to keep one of these players, possibly DeRozan, as his scoring ability is hard to replace even if he does not shoot the three-pointer well and plays similarly to backcourt mate Kyle Lowry. Biyombo performed well enough in place of injured center Jonas Valanciunas and some other team will overpay for his limited services based upon a small sample of games in the small sample size of the playoffs. Whether these two return or not, Casey enters next season with raised expectations regarding the success of the Raptors.